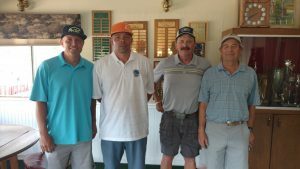 We held our annual NCGA Zone Qualifier on April 21st & 22nd. 1st & 2nd place teams earn the right to represent NCCC at the NCGA North Valley Zone Tournament later this year. Congratulations to the winning team of Dylan Murty & David Rivenes with a 2 day total of 116 (55-61) and the 2nd place team of Mike Blackston & Rick Honey with a 123 (64-59). Good Luck in Pebble Beach, Guys! !